In a Vase on Monday. Twigs. Today we have had sun and what a difference it makes. It’s been a joy to work outside, buds are budding, birds are singing and snowdrops are carpeting. Tomorrow it is all going to turn to worms with ice and snow so I’ve been putting hairnets on my vulnerable plants and getting on with my winter tidying. And it was heaven out there. I wanted to pick some flowers for a Monday vase but after grubbing for hours I can’t walk another step so here are some I prepared earlier. In the spring I am not too keen on forsythia. If I’d never seen it before I would probably think it was amazing but the stuff is ubiquitous, you find it in every suburban garden and it is such an unforgiving acid yellow. I have dug loads up here but I have left a huge bush by the big pond, a part of the garden you never see because I haven’t done anything to it, apart from planting a variety of bamboos. I keep this one forsythia because in winter it is fun to pick armfuls of it and watch the flowers opening indoors, it is such a welcome sight in January. With it I have some pink flowering currant, another plant you see everywhere in spring. Some people can’t stand the smell but I quite like it, like Proust’s hawthorn which he spent so many paragraphs describing, it reminds me of childhood. You probably know the magic trick of picking pink Ribes sanguineum and getting the surprise of pure white flowers opening up in the warmth of the house. I do have a lovely white flowered one called ‘White Icicle’ but this is a dark pink one. 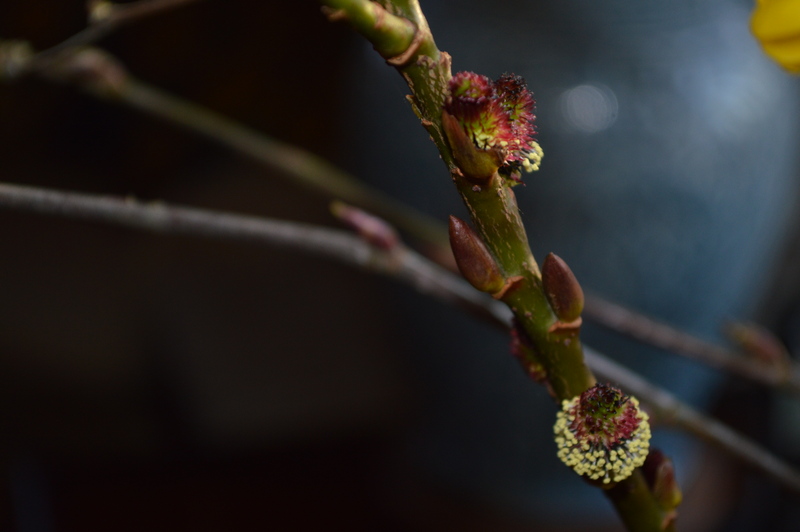 I also picked some twigs of the Salix gracilistyla ‘Melanostachys’ which has claw- like buds opening into black catkins with red anthers. As the catkins mature they are dotted with yellow pollen. I finished off with some sprays of orange Cornus sanguinea ‘Midwinter Fire’. I picked all this last week and it has been lovely watching the buds unfurling. The white jug is Portuguese and I bought it a few weeks ago. I can never resist a jug or ewer as the Americans call them. Who knew? The things you learn when you blog. Looking at the photograph it occurs to me that the white jug would look lovely with masses of white flowered Ribes sanguineum, so I shall pick some for next week. Thanks to Cathy at Rambling in the Garden who has gone for fragrance in her vase this week. If you pop over there you can find out what all the Monday Vase fillers have been up to. 38 Responses to In a Vase on Monday. Twigs. I’m learning from blogging also, as I never knew that a jug is called an ewer. I’m an American that never heard that word and spell check didn’t mark the spelling wrong. Oh do you call it a jug too? I read ‘ewer’ on an American blog and presumed that it was an American word. Like cookie or closet. Yes, I would say that it is a jug. My first day at an English college, the girls in our dorm asked us if we wanted biscuits and we thought they were going to bake “bread buns” for us. And then we asked for the bathroom and they showed us a room with a bathtub in it. Not what we were looking for. The same language with a lot of differences. They say we are two nations divided by one language. Interesting the differences in some terms. We always called these pitchers but I’m familiar with ewer. Jug was a new term for me, learned from my English blogging friends. By any name, your container and it’s contents are delightful. Such a pleasure to bring a bit of spring inside the house. Oh, of course, the word is pitcher, not ewer, thank you Peter. It’s pitcher I read on American blogs. I don’t know where ewer came from. Your lovely white job is perfect by the jug covered curtains – what fun. My Lonicera has just started flowering and now that it has actually grown I will bring some stems inside. Yes, I even have jugs on my curtains. Winter honeysuckle is great for picking and once it gets going you can cut as much as you like. The plain white jug is ideal for this arrangement Chloris. 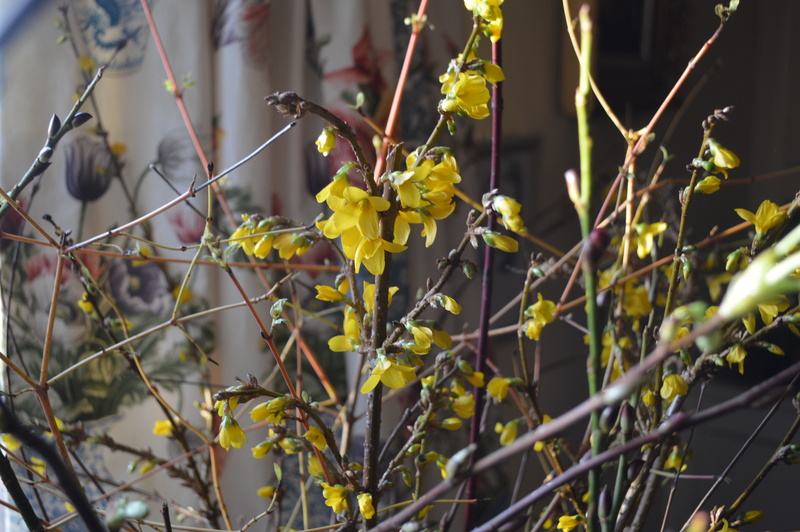 🙂 I must bring both Forsythia and Ribes from our old garden and put them in a vase to watch. I know what you mean about Forsythia, but the sight of it flowering in spring in all the front gardens here is quite spectacular after months without colour! I like them best in vases in winter, when there is not so much colour outside. I’ve been down and out with a virus, but you’ve inspired me to brave the chill outdoors for a handful of forsythia stems–also a holdover from a previous gardener. Nothing like a hint of spring to brighten the spirit. Oh dear sorry to hear you have been ill, there is a lot of it about round here. 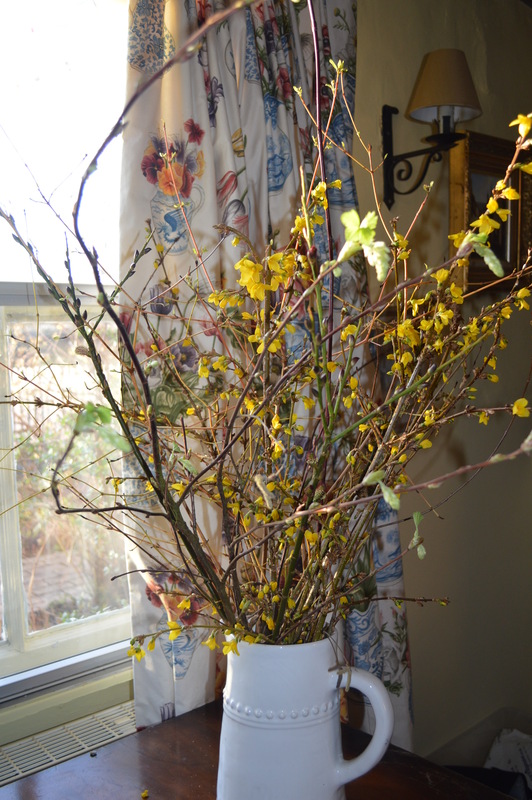 Yes the yellow forsythia does bring a bit of spring into the house. Just what we need. Oh thank you, I am glad you like it. I love the forced forsythia blooms but then here you rarely see either forced flower stems, or forsythias for that matter. I’ve very few deciduous shrubs or trees but you’ve got me thinking I should experiment in forcing blooms on the peach tree sitting at the bottom of my back slope. I rarely see the tree in flower as I work in that area only sporadically – it’d be a nice way to ensure I actually witnessed it in bloom. I forced some apple blossom last year and the flowers turned out white which was a shame as apple blossom is such a lovely colour. I love to watch leaves unfold inside too.. Soon I will be cutting some horse chestnut branches, they are my favourite in a large vase. Thank you, they are just plonked really, but they give long lasting pleasure. I wasn’t cold outside today or yesterday. But I was wearing my furry bear onesie which is incredibly cosy. Everybody who sees me seems to find the sight of a large bear in the garden uproariously funny. But I don’t care, let them laugh. Oh and I don’t need a hairnet, I have a hood with ears. Cheerful budding twigs. Hope the snow and ice is short-lived and you can carry on with sunshine! Thank you Susie. It’s February on Friday so spring can’t be far off. Thank you Annette. My forsythia is rather a sprawling mess but it is so big that I can cut loads off without worrying about it. You keep warm too and of course you will with your lovely wood burner. I must go out and cut some twigs! Yes do, they bring a bit of spring into the house. Oh that is a most warming cheery display Chloris. You must be a real hardy perennial to have been out there yesterday. It was a glorious day but that wind was biting. Maybe if I wasn’t getting over a cold I might possibly§ have ventured out. Isn’t a ewer a vessel for carrying water? I’ve just been explaining to Cathy that I have been cosy and warm in the garden wearing the furry bear onsie that my son gave me. One of the few advantages of growing older is that you don’t care what you look like. Yes, you are right about the ewer, for some reason I got pitchers and ewers confused. Oh, you’ve inspired me, Chloris! I need to head outside and see what twigs I can cut. Just the thing to cheer me up as we head into another snowstorm and Polar Vortex to follow. Polar vortex, oh dear, that sounds bad. 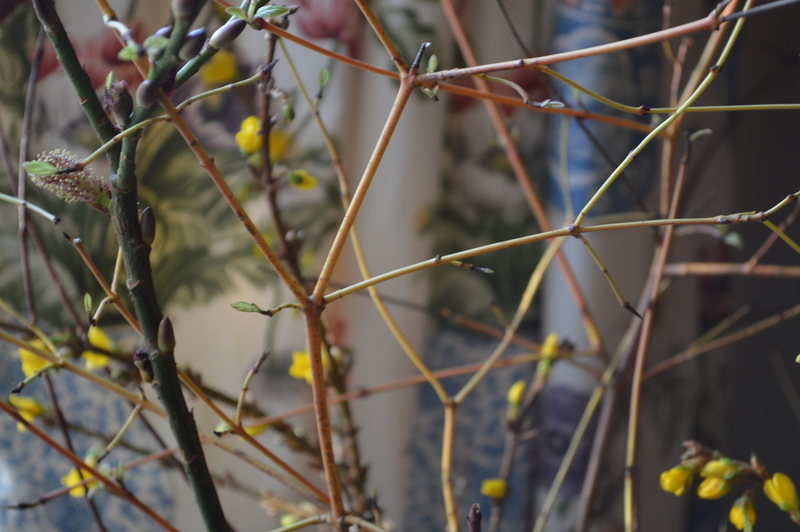 Yes, picking flowering twigs brings a bit of early Spring into the house. I like the vessel and the blooms. These signs of spring are so encouraging. I know there will be beautiful blooms in the not-too-distant future. Yes, February is a short month and then Spring here we come. Seriously? 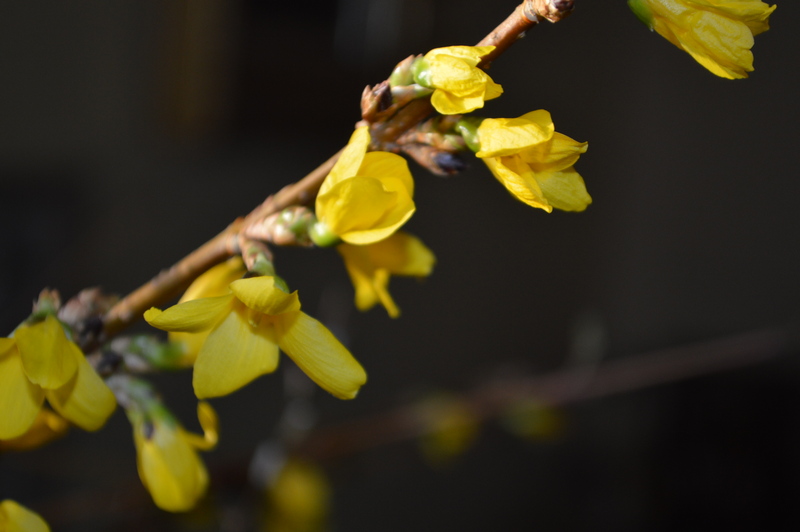 You are none too keen on forsythia? I just divided a few. I really dig it because it is so bright yellow now! It is uncommon here too, do lacks that stigma that it earned in other regions. It’s all over the place here so people get tired of it. I prefer forcing it to enjoy it out of season. What a wonderful collection of twigs and stems. I understand your ambivalence about Forsythia. I removed a whole planting of it on the east side of the house, but I’ve left one near the entrance to the back garden. 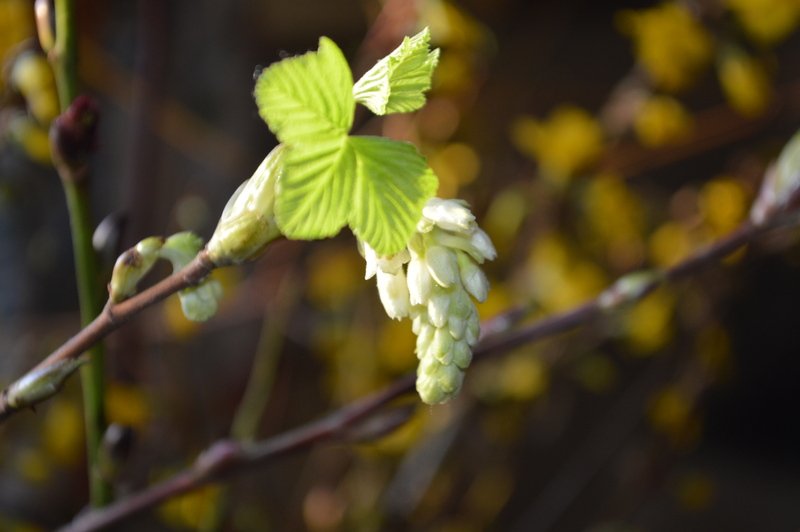 Not familiar with that trick with the Ribes sanguineum – cool! It is funny I was talking about forsythia yesterday. Neither the husband or myself is very keen, but the wife loves it, so it stays! Saying that, it does look nice with the other budding twigs in your lovely new vase.